University of Georgia Press, 9780820349237, 456pp. 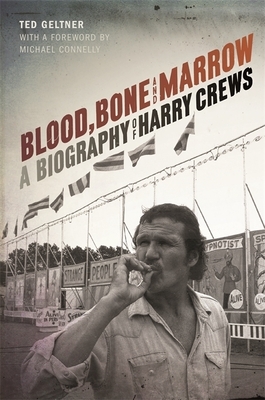 In 2010, Ted Geltner drove to Gainesville, Florida, to pay a visit to Harry Crews and ask the legendary author if he would be willing to be the subject of a literary biography. His health rapidly deteriorating, Crews told Geltner he was on board and would even sit for interviews and tell his stories one last time. "Ask me anything you want, bud," Crews said. "But you'd better do it quick." The result is Blood, Bone, and Marrow, the first full-length biography of one of the most unlikely figures in twentieth-century American literature, a writer who emerged from a dirt-poor South Georgia tenant farm and went on to create a singularly unique voice of fiction. With books such as Scar Lover, Body, and Naked in Garden Hills, Crews opened a new window into southern life, focusing his lenson the poor and disenfranchised, the people who skinned the hogs and tended the fields, the "grits," as Crews affectionately called his characters and himself. He lived by a code of his own design, flouting authority and baring his soul, and the stories of his whiskey-and-blood-soaked lifestyle created a myth to match any of his fictional creations. His outlaw life, his distinctive voice and the context in which he lived combine to form the elements of a singularly compelling narrative about an underappreciated literary treasure. TED GELTNER is an associate professor of journalism at Valdosta State University, adviser to the campus newspaper, and author of Last King of the Sports Page: The Life and Career of Jim Murray. He worked for seventeen years as a writer and editor at a number of newspapers, including the Gainesville Sun, the Scranton Times-Tribune and the Ocala Star-Banner.